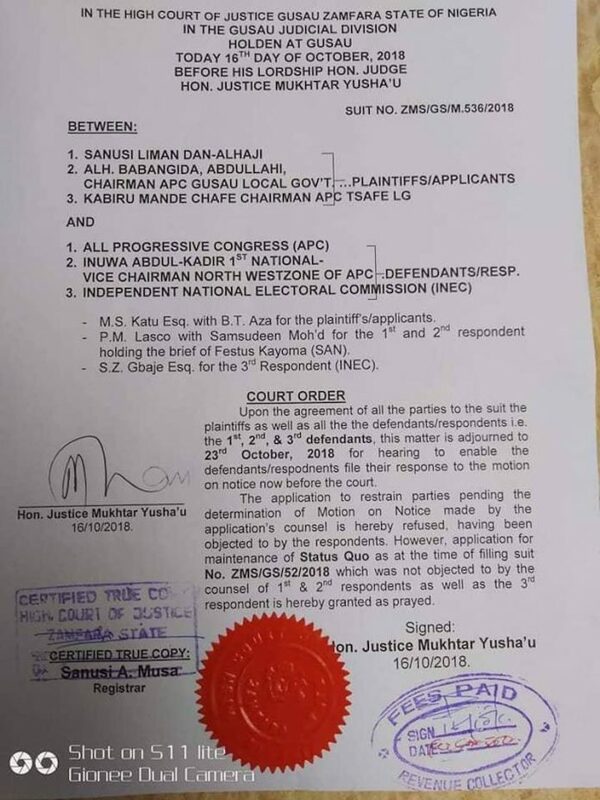 The Zamfara State High Court has issued an interim order restraining the All Progressives Congress (APC) and the Independent National Electoral Commission (INEC) from disqualifying the party’s candidates from the state for the 2019 elections. The trial Judge, Justice Mukhtar Yushau gave the order on Tuesday, following a suit filed by three executive members of the party in the state – the Chairman of the party in Gusau Local Government Area, Babangida Abdullahi, his counterpart in Tsafe Local Government Area, Kabiru Chafe, and Sanusi Dan-Alhahi. In the suit, they challenged the powers of the national leadership of the APC and INEC to disqualify the candidates from contesting for various elective positions in the 2019 elections. The plaintiffs filed the application on behalf of 24 other candidates on October 8, 2018, through their counsel, Muhammad Sani Katu. In his ruling on the suit, Justice Yushau, issued an order of interim injunction ordering the APC, the party’s north-west zonal chairman and INEC to maintain the status quo as at the time the plaintiffs filed the suit on October 8, 2018, which was not objected by their counsels. The judge, thereafter, adjourned the matter to October 23 for hearing to enable the defendants file their responses to the motion on notice now before the court.